Relative priority (selection frequency) of areas for meeting biodiversity and carbon goals for environmental planting overlaid with Indigenous tenure. Climate change has prompted the development of methods to reduce greenhouse gases in the atmosphere. Many countries have established emissions trading schemes offering incentives to offset carbon emissions. In addition to carbon storage these schemes have the potential to deliver other environmental benefits such as biodiversity conservation and the provision of other ecosystem services. However, there has been concern that they do not contribute to sustainable development and in particular their lack of provisions to encourage and sustain the involvement and provision of co-benefits to Indigenous communities, and respect of their traditional livelihood and land-uses practices. One carbon trading scheme is the Carbon Farming Initiative (CFI) established by the Australian government to provide opportunities for land managers and local communities to reduce or sequester carbon emissions by altering land management practices. Tree planting is one approved methodology to sequester carbon and, if mixed native trees are planted, has the potential to provide additional ecosystem services as well as added resistance and resilience to disturbances. Unlike some carbon trading schemes, the CFI legislation contains provisions to provide benefits to biodiversity or Indigenous communities, and many indigenous leaders have shown interest in carbon offset projects, and their associated co-benefits and opportunities they provide including working on country, education, training and increased decision making powers. However, determining the optimum locations for tree planting to ensure more’ bang for their buck’ is unknown. Anna Renwick, a postdoctoral research fellow at the University of Queensland and CSIRO, along Josie Carwardine and other colleagues at CSIRO and the University of Queensland conducted a spatial analysis of the carbon and biodiversity potential of planting biodiverse native vegetation on Indigenous land across Australia. Using the conservation planning tool Marxan and an economic scenario reflecting the Australia government’s 2011-2012 carbon trading price of AU$23/tonne the cost-effectiveness of areas across Australia for sequestering carbon and restoring each vegetation type up to 30% of its pre-1750 extent was calculated. We then determined the relative priority of the areas within the potentially plantable area for meeting the combined carbon and biodiversity restoration target cost-effectively. Finally we overlaid the map of Indigenous land tenure, composed using data sourced from the official agencies responsible for the registration of various Indigenous land tenures including the National Native Title Tribunal, Conservation and Protected Areas Database, Australian Government Department of Sustainability, Environment, Water Population and Communities, Indigenous Land Corporation, National Land and Water Resources Audit and Geoscience Australia, with maps of carbon sequestration, biodiversity features and the relative priority areas to determine the proportion of carbon and biodiversity goals that can be met on Indigenous land, and the proportion of very high, high, moderate and low priority areas on Indigenous land. Approximately 92 million hectares of land in Australia has been cleared and has the potential to be replanted with native vegetation sequestering around 710 Mtonne CO2/year over the next 40 years. The amount of this area that will available depends on the profitability for environmental planting which is dependent on the carbon price and other economic, social and practical constraints in the area. Using the 2011-2012 Australian’s carbon trading price of AU$23/tonne, 31 Mha of the area is profitable for carbon farming sequestering 294 Mt CO2. Almost a third of this area, 9.7 Mha, is on Indigenous land which would sequester 83 Mt CO2 (28% of the total). If, however, the price of carbon drops to AU$5/tonne, close to the 2013 international markets, the profitable area for carbon farming is reduced severely to only 5Mha and the potential for Indigenous communities to get involved would be greatly limited. 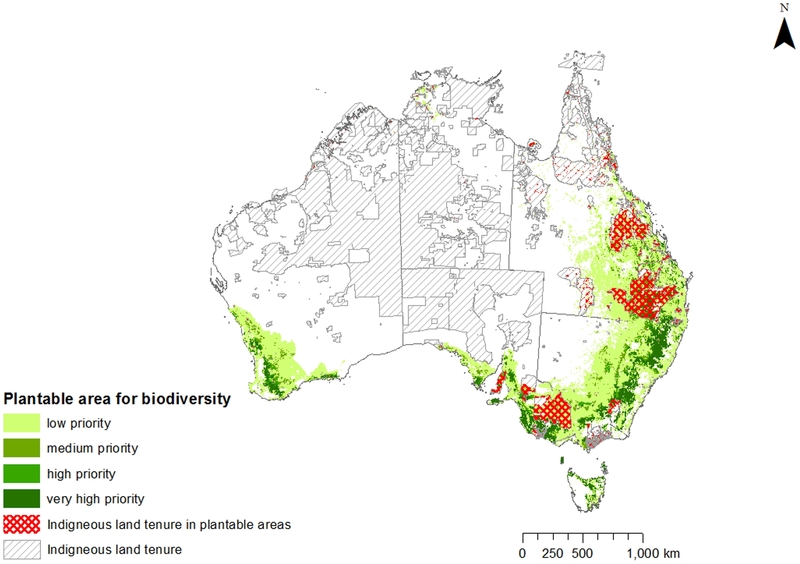 Almost 19% of the combined high and very high priority areas for cost-effectively meeting biodiversity goals are on Indigenous lands primarily in southeast Queensland, eastern New South Wales, southwest Victoria, southeast South Australia and southwest Western Australia (see map). There are little carbon and biodiversity benefits from planting on Indigenous land in northern Australia reflecting the low density of forests and historical clearing in this area although other carbon offset schemes in this area may be more appropriate, for example savanna burning. Given that Indigenous land cover 19% of the total biodiversity plantable area, this result indicates that Indigenous lands are approximately as important as the rest of Australia for achieving this combined goal cost-effectively. This top-down approach provides one perspective of the potential for Indigenous communities to get involved in carbon projects. The next stage is to test these model results in partnership with local Indigenous communities who may require additional information, special training and community engagement skills. Despite the positive potential for the CFI to contribute to biodiversity and provide benefits to Indigenous communities and broader society, the recent change in government in Australia highlights the instability of the policy and political environment surrounding the CFI opening up new risks and uncertainties to carbon farming efforts, including those adopted by Indigenous communities.